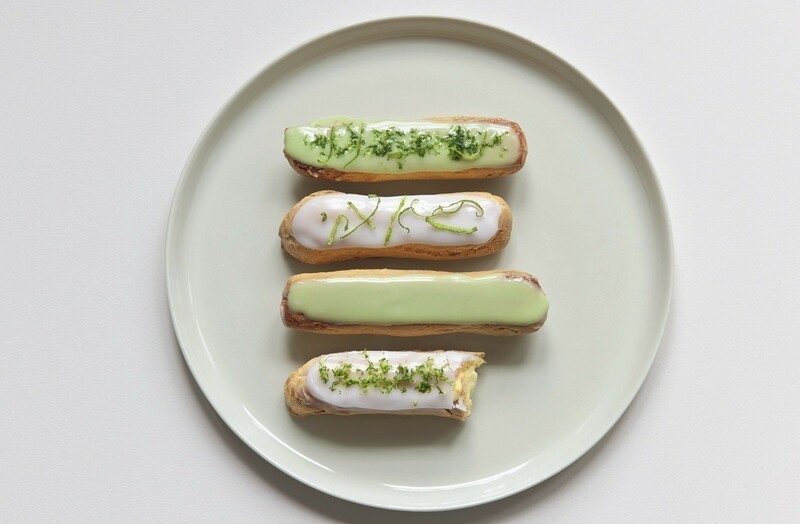 Recipes and images taken from Secrets of Eclairs by Marianne Magnier-Moreno (£8.99), published by Murdoch Books. Posted by Murdoch Books • Published 14th December 2012 • See Murdoch Books's 60 projects » © 2019 Marianne Magnier-Moreno / Murdoch Books · Reproduced with permission. Wash the lime, remove the zest and reserve the fruit. Add the zest to the milk and make a crème pâtissière with this infused milk. Cover with plastic wrap placed in direct contact with the crème to prevent it forming a skin and refrigerate. Preheat the oven to 150°C (300°F/Gas 2). Make the choux pastry dough and use it to fill a piping bag fitted with a plain 20 mm nozzle. Position it at a 45 degree angle in relation to the baking tray and push out the mixture while moving the bag in one clean movement to give the éclair a nice straight shape; apply an even pressure to the piping bag so that the tube of mixture that comes out has the same diameter as the nozzle. When the éclair is 14 cm (51?2 inches) long, cut off the mixture with a smooth-bladed knife. If necessary, smooth the éclairs with some of the beaten egg left over from making the pastry or else with water. Bake for 55–60 minutes. Remove from the oven and allow to cool on a wire rack. Juice the reserved lime, add half of the juice to the cooled crème pâtissière and whisk vigorously until smooth. Taste and add more lime juice if desired, then fill the éclairs with lime crème pâtissière. Zest the lime and reserve. Warm the fondant over very low heat to lukewarm with a few drops of water, stirring constantly. When the mixture is a little below body temperature (about 35°C/ 95°F), add a little more lukewarm water until you have an icing that drops from the spatula without merging immediately with the rest of the fondant. Add the yellow and blue food colouring, if desired, until you have a pretty lime green then remove from the heat. Dip the top of a filled éclair in the icing, then hold it vertically and run a finger over it to remove the excess icing. Run a finger around the edge of the icing so you have a nice clean edge. Scatter the top with lime zest. Ice and decorate the other éclairs in the same way, making sure you stir the fondant well before each use.